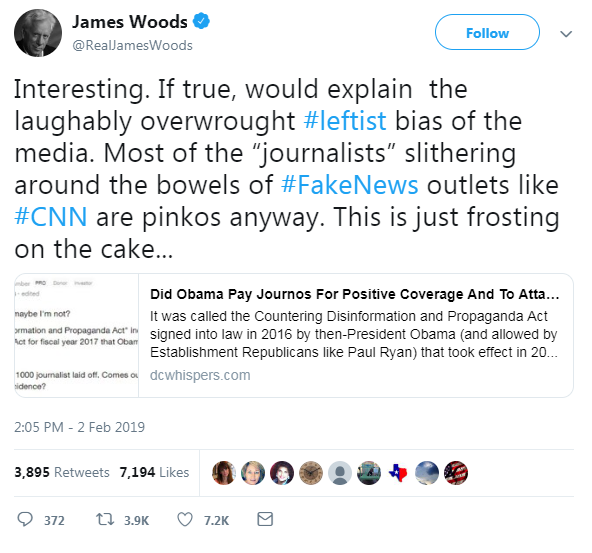 Right-wing media personalities and trolls are now blaming former President Barack Obama for the recent layoffs across news media, claiming that they were the result of the previous administration’s propaganda funding finally drying up. The new conspiracy narrative builds on another right-wing conspiracy theory that first appeared in 2016, alleging that Obama’s Countering Foreign Propaganda and Disinformation Act, designed to combat foreign propaganda, was in fact created to fund counter-narratives and attack independent or alternative conservative media within the U.S. When news hit this week of mass journalist layoffs across major online liberal publications like BuzzFeed and Vice, two QAnon devotees on social media platform Gab flamed the narrative with some dubious mathematics by suggesting the reporters lost their jobs because the Obama bill’s funding for “leftie propaganda“ ran out. It quickly carried to other users in the QAnon Gab network, where it eventually crossed over to Twitter. Guys, THIS is why all those ‘journalists’ now have to #LearnToCode!! They were literally a Leftie propaganda wing being propped up by the Obama administration, and the American taxpayer was footing the bill. Even actor James Woods shared it in a since deleted tweet. From these communities and users the story carried upward through the fringe right social media sphere and into the conspiracy peddling right-wing media ecosystem. By the time the “learn to code” meme was spreading, the original Gab posts were ranking on the internet’s biggest pro-Trump community r/The_Donald, based on Reddit, where it stacked over 3,000 upvotes. As a result of its growing popularity, the conspiracy narrative got featured in several low-level, far-right news outlets like DC Whispers and NewsPunch—which had pushed the original theory, about Obama funding liberal media, back in 2016. Alex Jones’ InfoWars, known for peddling conspiracies about mass shootings and leading Democrats, also picked up the theory for its own site. In recent years, InfoWars has served as a key node for hyperpartisan conspiracies to find their way into the mainstream conservative news ecosystem and cycle but, after being deplatformed and demonetized by major social media companies, Jones’ outlet appears less effective as an amplifier of fake news. There is no proof that an Obama-era funding program propped up media organizations. The post Right-wing conspiracy blames Obama for media layoffs appeared first on The Daily Dot.